Today's HFN magazine shares Bridge's progress with helping independent retailers. Bridge would like to thanks its members for helping everyone make it to this milestone. NEW YORK- Bridge, a tabletop ecommerce platform, has helped its retailer partners cross the $1 million mark for online gift registry sales. Bridge offers retailers, typically smaller independents, a full online catalog of select tabletop brands that are constantly updated and maintained by individual vendors. In 2014, Bridge helped its retailers sell about $750,000 via online registries, according to Bridge Founder Jason Solarek. "With two months still left in the year, we've beat that number by 33 percent," he told HFN. 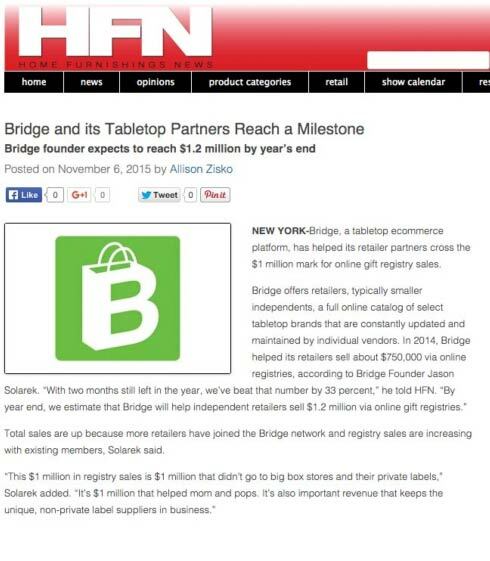 "By year end, we estimate that Bridge will help independent retailers sell $1.2 million via online gift registries." Total sales are up because more retailers have joined the Bridge network and registry sales are increasing with existing members, Solarek said. "This $1 million in registry sales is $1 million that didn't go to big box stores and their private labels," Solarek added. "It's $1 million that helped mom and pops. It's also important revenue that keeps the unique, non-private label suppliers in business."